In the early 1900’s, motorized transportation technology was evolving quickly. Police departments were looking to move beyond horseback and buggy patrols and wanted to capitalize on new motorized vehicles to modernize their agency patrol capabilities. In the west, Portland Police Bureau’s hired motor officer Merle Sims in 1909 because he owned his own Indian motorcycle, which was the first mechanized patrol vehicle for the agency. The Portland Police Bureau was so impressed with Motor Sims’ performance that the agency purchased two additional Indian motorcycles and the Portland Police Bureau started their first motorcycle patrol squad. 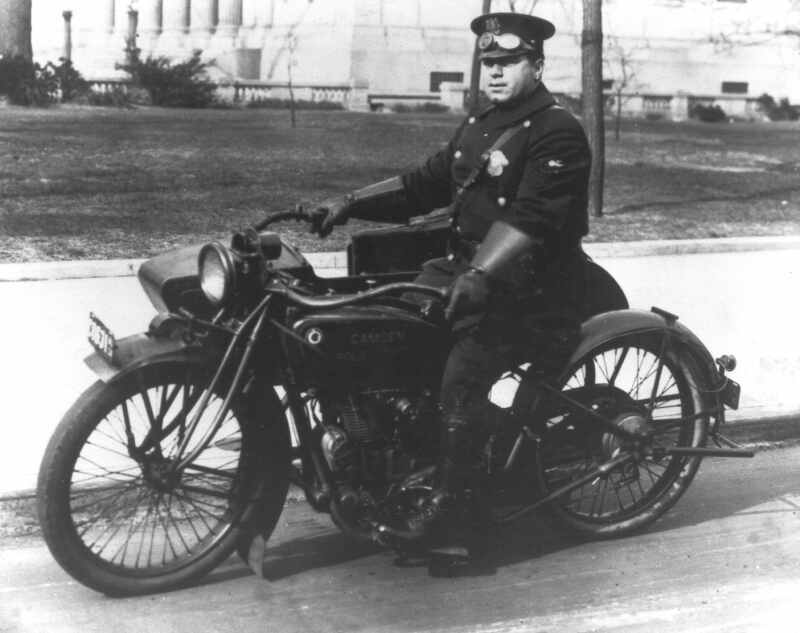 In California, Chief August Vollmer of the Berkeley Police Department created one of the first dedicated motorcycle patrol units in 1911. The Berkeley Police Department developed some of the first motorcycle patrol training, policies, and procedures as well as modified their Harley-Davidson and Indian motorcycles specifically for police patrol with saddlebags for extra storage. As the new motorcycle officer was becoming the visible symbol of American mobile policing, departments also adopted a traditional style of patrol uniform previously worn by the horse-mounted officers of days past. This horse-mounted uniform influence is noticeable in the design of the modern motorcycle police officer’s recognizable and iconic uniform. With the end of WWI, the U.S. had a surplus of motorcycles and sidecars. Police departments across the country quickly took advantage of the surplus inventory and reduced prices to expand their motorcycle patrol units. Indian and Harley-Davidson soon emerged as the predominate motorcycle manufactures for police fleets due to their reliable and local dealer services. By 1929, Harley-Davidson motorcycles were being used by approximately 3,000 police agencies around the world to enforce traffic and parking laws as well as traffic accident investigation. In 1931, Harley-Davidson introduced the three-wheel Serv-Car (trike motorcycle) that became very popular inn= police departments for traffic enforcement. During WWII Harley-Davidson produced nearly 90,000 motorcycles for the war effort. Once again, the war surplus and reduced pricing was passed on to civilian police departments. The surplus motorcycles, as well as returning restless combat veterans, gave rise to motorcycle clubs and hot-rod car clubs. To curb the racing on public roads, law enforcement turned to the motorcycle officer to enforce traffic laws and deter unsafe driving habits. This vigorous traffic law enforcement gave rise to the American 1950’s iconic image of a motorcycle police officer parked behind every highway billboard ready to chase down speeding motorists and issue traffic tickets to violators. The value of motorcycle patrol is even more relevant today than when it began more than 100 years ago. With the ability of the police motorcycle to quickly navigate congested modern traffic and quickly get to an accident scene, more agencies are expanding their motorcycle patrol units. In addition to speed enforcement and traffic accident investigations, motorcycle patrol units can be seen enforcing school zone traffic and red-light enforcement in targeted areas where there are higher accident rates. Citizens positively respond to the visibility motorcycle patrol officers bring to their community. One of the greatest benefits of motorcycle patrol is the connection to the community. Several studies have shown that citizens feel more comfortable approaching a motorcycle officer for assistance. One of the reasons noted was that motorcycle officers are not hidden in a patrol vehicle. Citizens reported they feel motorcycle officers are part of the community because of their visibility. Motorcycle patrol units are visible in the community conducting funeral escorts and providing dignitary escorts as well as ceremonial duties such as leading community parades. Motorcycle police patrol has a long tradition and the reason for this longevity is the diversity and adaptability to current social trends that make the motorcycle unit an indispensable and relevant part of any modern law enforcement agency. Posted in Mark's Articles and tagged Corrections, Courts, Crime Analyst, Crime Mapping, Crime Scene, Criminal Intelligence, Criminal Justice, Criminology, Dispatcher, Militray, Motorcycle Police, Police, Sheriff. Bookmark the permalink.